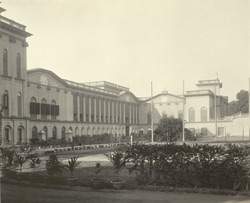 Photograph of the Palace of Burdwan, taken by an unknown photographer around 1904. This is part of a album of photographs presented to Lord Curzon, the Viceroy of India, by Bijay Chand Mahtab of Burdwan (r.1887-1941), on his short visit to the city on 2nd April 1904. Burdwan was the capital of the district and the residence of the Maharajas. The Burdwan Rajas trace their origin to 1657 when Abu Rai was appointed chaudhari and kotwal in Burdwan but they gained the title of Raja in 1741 with Chitra Sen Rai. They become an important family, holding high office in the Bengal Executive Council in the 1920's. The Thara Palace was built in the19th century in a European style. It used to have a fine collection of pictures of British painters such as the Daniells, Chinnery and Tilly Kettle. The building now houses the University of Burdwan.